Yoshi's Story was the first game I've ever played. It was incredible. It made me into who I am today by introducing me to a new form of entertainment. Video games became my favorite thing to do. Video game characters became the ones I cared about most. Drawing pictures of video game characters led to me making comics about them to share with my classmates. That triggered the creative drive fueling my fiery passion that burns today. Today, I'm gushing about the game that started it all. Here is Yoshi's Story. The introduction cutscene was fun to watch, like flipping through a pop-up book. I couldn't really read yet so the menu was gibberish to me. I messed around and ended up pushing 'A' on the green option which happened to be the tutorial. I had an idea of how games worked because I watched my brothers play Sonic (with lots of envy) but I was literally a baby back then. This was my first time moving a character around on screen. I admit to being stuck on some part involving a white shy guy for what felt like an hour though. I used that time to wrap my head around the concept of controlling a cartoon with a giant 3-pronged remote. I got a feeling for what you could and couldn't do. I learned that every button had a purpose, unlike TV remotes which, for me, only had power and channel buttons that mattered. I'll never forget that gorgeous art style. 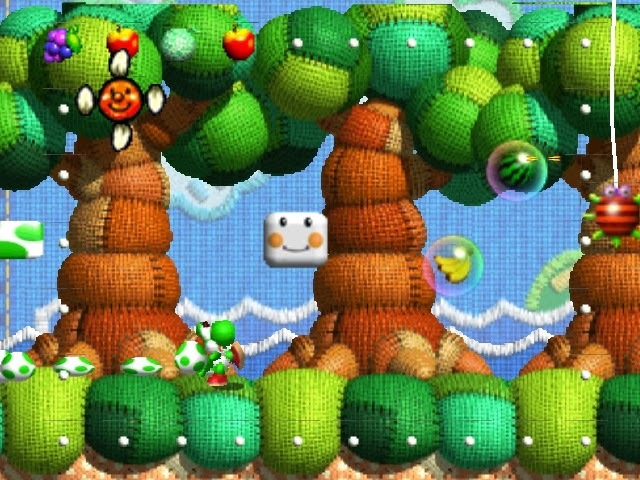 Everything had a hand stitched/drawn/crafted feel and a detailed and expressive 3D baby Yoshi sprite popped out from the background. I love how you could feel everything on screen. It looked a lot better than Sonic and Yoshi kind of reminded me of Sonic (every game character did until I got Sonic Adventure years later) and that helped me care more. Yoshi became cool to me. I eventually got used to the way the game worked and fell in love with how Yoshi worked and separated him from Sonic in my mind. At that point I gave up on the tutorial and reset the game. I'm pretty sure it was my mom who suggested touching the reset button on the front to start over. 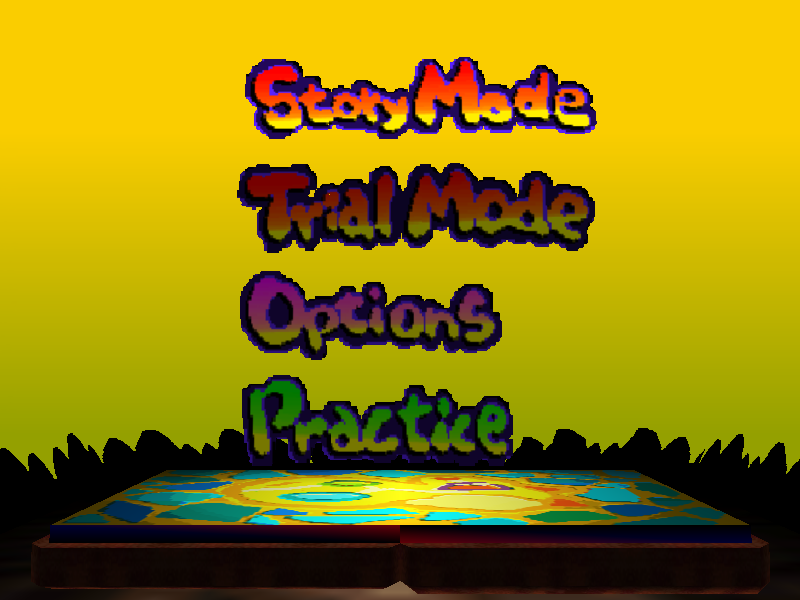 I didn't know what I was doing so I assumed I picked Story mode because I was curious what picking the other words in the menu would do. I picked the first and started the real meat of the game. 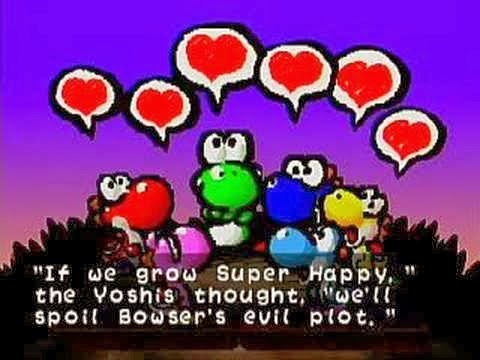 The epic branching storyline of Yoshi's Story. Since I wasn't reading along, for all the levels I just thought of my own explanations for the pictures being shown in cutscenes. Tree was good, it was stolen, Yoshi's were sad. The babies band together to get the back. That includes me. /this was my problem now and I had to help the Yoshi's solve it. I was officially emotionally invested and this was already better than cartoons. My mission was to stop this evil guy. Some meanie named Baby Bowser. 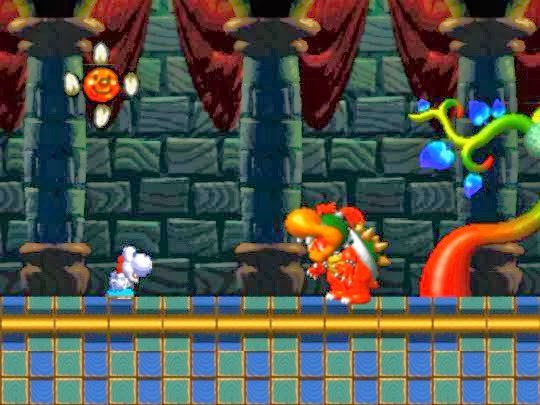 Every time I messed up and let Yoshi get hurt, his minions would take my poor friend away and lock 'em in a scary tower. I watch in horror as the taken Yoshi sheds tears as it's being whisked away. That's what made the stakes high. Either I find that Happy Tree, or the Yoshis will cry. I had no choice in the matter. I traveled across a variety of worlds. Never knowing what to expect next. I was having the time of my life playing this game. I never got very far at first, always having to turn off the game for one reason or another over the year(s). I don't know how long it took, but each time I played I got a little farther. I had no concept of saved games back then and just expected having to start over every time. I was okay with that though. 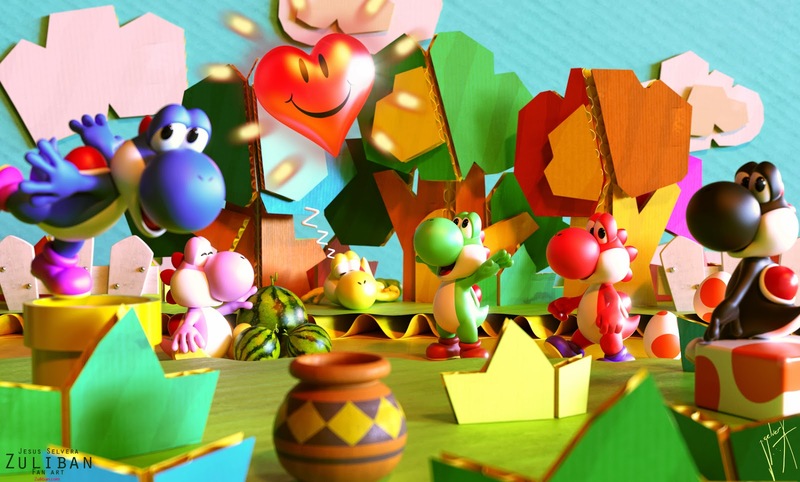 I knew that one day I'd save the Super Happy Tree an make the Yoshis happy again. I knew that turning off the game and trying again later meant all the Yoshis that were taken away would come back and I'd get a fresh start. I really loved the cool variety of locations in the game. 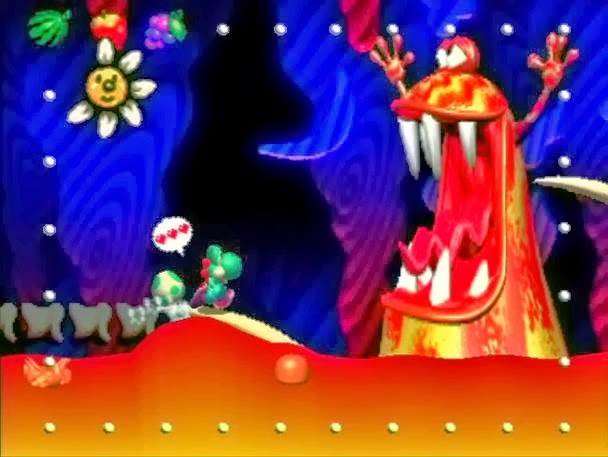 After beating a level you were treated to a happy, heartwarming song sang by baby Yoshis that become more and more adorable then get to see an entirely new color palette on the next stage. It felt like a grand adventure spanning across a vast fantasy world. There were levels in fields, caves, volcanoes, oceans, beaches, the sky, you name it. And to make things even better, each world had multiple stages in it but you could only pick one on a playthrough before moving into the next world. Every time I played I could try a different number and see a new level. I recently found out that these alternate levels are revealed by collecting giant hidden hearts in each stage to unlock the next world's extra levels on every playthrough. Seeing what the next page would hold became another reason to win each level. Watching every world page animate became a fun activity in itself. I fell in love with the games soundtrack pretty quickly this way.Each world had more than just new visuals too. Every level had something special to do. Some let you climb aboard a flying dragon, dodge pirate cannon fire, avoid razors that jut from the ground, ride across the sky on skateboard feathers, and use springs to bounce higher and higher. Each one taught me both a new game mechanic, and a new way to see the world. I learned lots of subtle things from messing around this game's virtual environments. Things like how the world reacts to things that inhabit it, how to time jumps and judge distance, and how to find small details leading to big rewards. It's difficult to put into words but I got more out of living through adventures than through watching them in cartoons. When I think about the game its monsters are one of the first things to enter my mind. There is a wide array of unique baddies and obstacles to keep me on my toes. These same monsters were the ones I'd doodle on paper at every opportunity, sparking my interest in character art. A few particular favorite designs of mine are the lava monster, water wave monster, piranha plant jungle, gold-plated raindrop knights, bone dragons, and the ever present Shy Guys. If they count, I'd also include the blades from the final level. These threats blend perfectly with their respective environments and have a kind of charming aesthetic that captivated m young mind. Some monsters scared me, others had me in awe, and others yet had me fascinated with their movement patterns and behaviors. A good amount of my first playthrough was spent stuck on puzzles. There were just some things that were hard for me to grasp at first, like crossroads that went downward, obstacles where you have to stay airborne, and a particularly infuriating rat-elephant enemy with a stop sign requiring me to use the ground pound technique for the first time. Overall, the game does a good job explaining it all, it just takes a 5-year-old a few minutes to comprehend these things. Something I liked about Yoshi's Story was the way each level didn't have an end on the far right side. The level transports you to different sections and eventually loops around. You warp around with jars in place of the common Mario pipes or by jumping on numbered sleeping jumping kids. 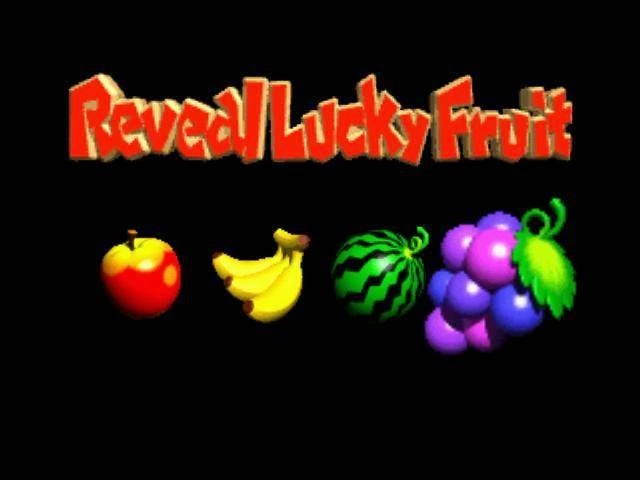 Gameplay didn't end until you collected enough fruit to fill the screen's frame. Since this was my first game I didn't realize how special that idea was. To thins day I can't think of any platformers without a goal portal of some kind. 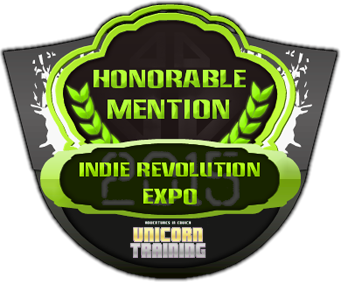 I also loved finding rewards when I explored for a bit, stepping away from the obvious path. I liked discovering little things like holding 'R' to have the camera zoom in as Yoshi sniffs for collectibles and pounding the ground to change all on-screen Shy Guys' colors. It was also endless fun just eating every enemy on screen and getting the happy fruit which spawned coins everywhere and changed the music into a rock remix with a wild guitar. Even the flower representing your health was rockin' out when you got one. The recent Sonic title on WiiU brought back the Yoshi's Story island with a cup of nostalgia juice. The art style can be seen in HD here and it looks amazing. Thinking of what Yoshi's Story would look like today is getting me excited for the new installment coming soon. The old game's art actually holds up quite a bit. Like The Wind Waker, the art style makes it timeless. You can always tell what everything is on a detailed level and recognize the visuals as gorgeous. 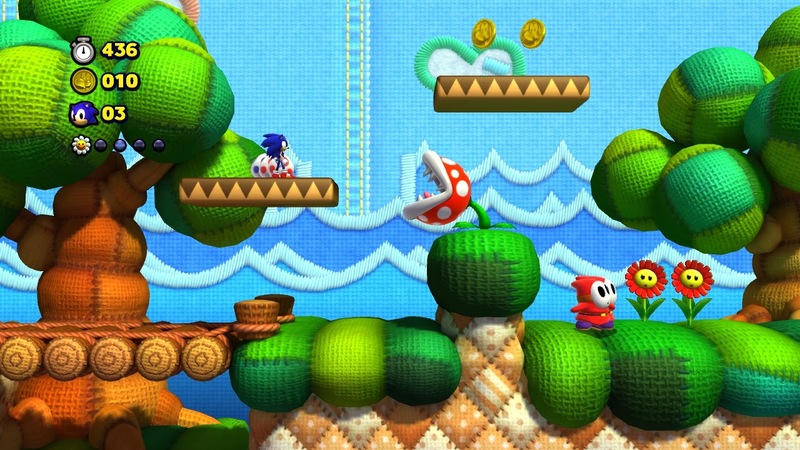 The new game seems to be taking the Kirby's Epic Yarn style and meshing it with LittleBigPlanet and Yoshi's Story. A very good combination if you ask me. But that's for later. All I have right now is fond memories of the original. Believe it or not, this is where I learned about fruit. 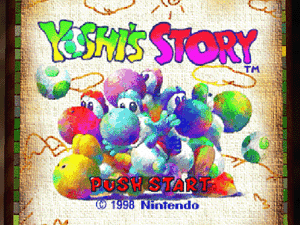 When I think of grapes and melons, the Yoshi's Story ones are the fruit that come to my mind. For the longest time I didn't understand the difference between the watermelon (above) and the melon (below). I assured the latter were just cabbages/lettuce. When I re-bought this game on Wii Virtual Console I came to it with a new appreciation. I tried things like Melon Only challenges where I could only beat each level by finding the well-placed rare melon fruits. It allowed me to look closer at each level's design and see what the developers wanted players to see when trying to 100% a level. 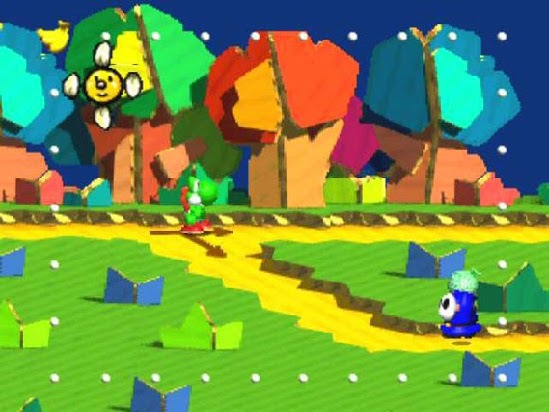 Unlocking stages and finding secrets was half the fun of Yoshi's Story. Back then I had no one to share secrets with so each discovery was my own. 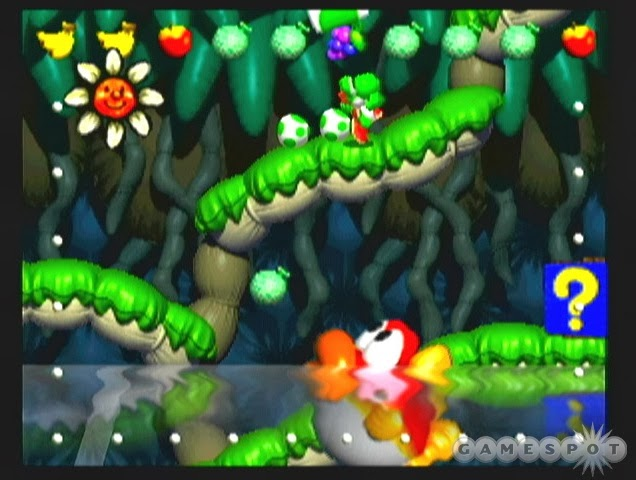 I remember the epic discoveries of the hidden black and white Yoshi eggs which hatch into Yoshis that were much cooler than the others. 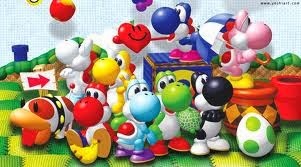 Whenever I couldn't be one of them I always favored the red, blue, light blue, and green Yoshis. 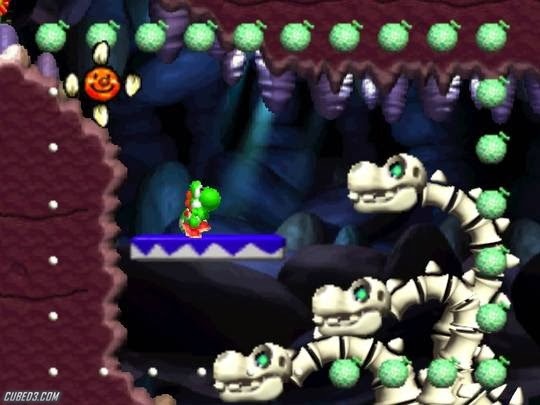 The ultimate reward for exploring was finding these secret Yoshis that could eat things other Yoshi's couldn't like hot peppers and black Shy Guys. Nightmares were overcome when I played this game as a kid. I was afraid of the lava monsters, I feared the final level's razor sharp blades, and I was utterly terrified of the hungry fish in the jungle (actually, I think I'm still afraid of that thing). Despite these menacing obstacles I had a mission to accomplish. I needed to save the Super Happy Tree. I swallowed my fears and pressed on challenge after challenge one day, determined to see the game's end, if there even was one. I had no idea how many worlds there were until I got to the final one. A very familiar looking spooky castle. The one where Yoshis are taken when I lost them. This was my one and only video game and I wanted to save the Yoshis I loved so much. I was going to finish the story once and for all. Little did I know the ending wouldn't be very triumphant. It was actually one of the saddest and scariest moments of my life. 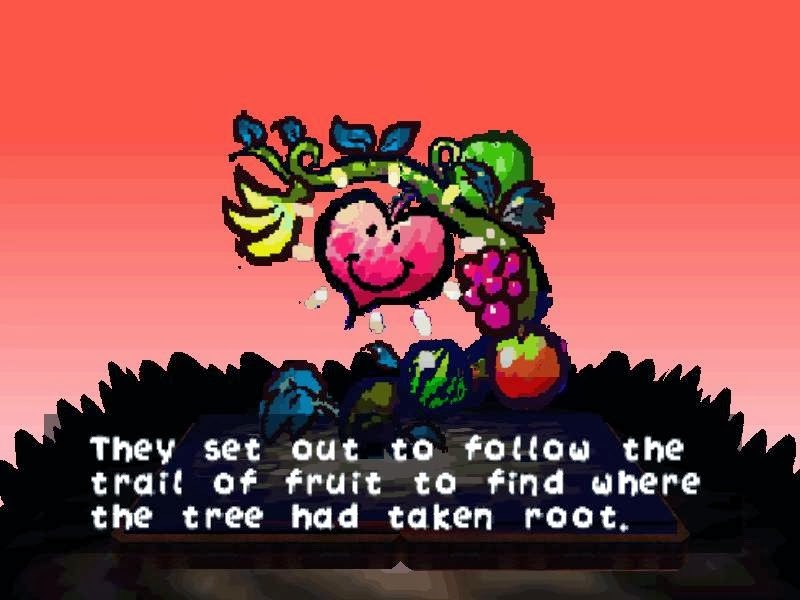 I vividly remember defeating the final boss, the sweet taste of victory in my mouth and the Super Happy Tree in sight. The same tree that gave me the power ups to defeat Baby Bowser. I didn't know what to expect when I finally won. 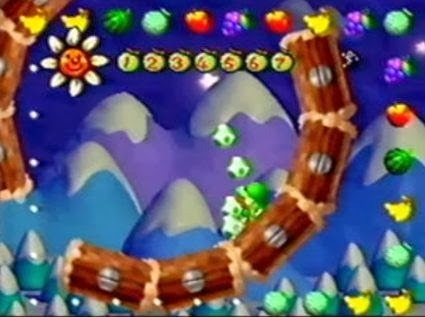 I never knew what to think when a level ended in this game. What I was treated to upon victory was a recap of m adventure. By this point my reading skills had improved slightly but I still only understood the general feel and a few words. But the game had one last surprise for me in the form of the saddest, sweetest, most beautiful credits I had ever witnessed. As a small child I wasn't putting the pieces together. By the looks of things, the game was over. The video game that I loved so much, the only one I had, the highlight of my day for the past however long... Was over. And I thought I could never play it again. I thought I could never play anything again. I knew what "END" meant and I really thought that was it. To this day I don't think I ever cried that hard. I remember being in a room all alone, sobbing in bed with the "HAPPY END" image on my TV screen and sad music playing. My Yoshis were gone forever. I didn't talk much as a kid. My parents tell me about how quiet I was and how they could just give me a new video game every once in a while and never worry about be causing trouble. This was one of those rare times I ever spoke out loud when playing a video game. I let out a cry of "Oh no..." as tears poured out and I watched the thing I grew to love most go away forever.Too young to fully grasp the concept of loss. 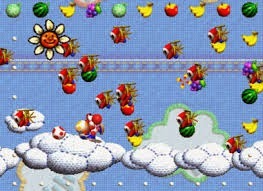 I couldn't stop thinking about the lost Yoshis that became my imaginary friends. I couldn't stop thinking about how I'd never play a game again. How it was so beautiful... The greatest experience I'd ever had. I mourned the loss of my favorite activity the way others would mourn a friend. My tears dried many minutes later and I got up to finish the job, pressing start to make the screen go black. That's when something unexpected happened. The start button brought up the title screen, not the contents of my empty heart. The cinematic joy I felt when realization washed over me was indescribable. First I was shocked, then confused, then in awe, then smiling, then ready to laugh all within 3 seconds. I couldn't believe it but the game was still there. I could still play with my Yoshis! The experience of beating Yoshi's Story is one of my earliest and most powerful cherished moments. It's the first time I ever felt so strongly about something. I was able to distract myself from my parents' recent divorce and play in a fantasy world I never could have imagined with toys or felt with cartoons. The pure emotion I felt during my episode is a solid reminder of what video games mean to me and always have meant to me. To outsiders all the drama over a video game may seem silly, but outsiders weren't the little kid bawling his eyes out that afternoon. Like a love story or a tale of a boy and his dog, this was a definitive emotional moment that bonded me to video games forever. This great game opened my heart to a new medium to lose myself in. Video games became the biggest influence on my imagination after that. Today, games are still just as important to me as they were when I thought I'd never play another one again. It's strange to think back to when I was 5 or 6 and realize that moment where I thought I'd never play a game again was the key moment of my life that pushed me in this direction. After considering life without Yoshi or Sonic I went out of my way to try as many games as possible when I found them or whenever my parents would give me one at random. Like many gamers, I received my childhood video game passion from Nintendo. I just know I'll always be a fan of that company because they keep making games like this. Ones that touch my heart and provoke my imagination. The Zelda series in particular gets the most emotion out of me these days. That Nintendo magic is probably why I want to make a variety of colorful games like them. They are the kinds of games I like most. Making a game that inspires someone the way Nintendo inspired me would be the greatest possible thing I could achieve as a game developer. At least on a personal level. Everyone has a special game that triggered a love for gaming. Tell me yours in the comments if you have one. I'd like to see where other people got their start.